The Red Sox made a surprise announcement on Sunday that they will be going with Nathan Eovaldi instead of Rick Porcello as their starting pitcher in Game 3 of the ALDS on Monday night at Yankee Stadium with the series tied at one game apiece. When the Red Sox acquired Eovaldi from Tampa Bay in July, the move was done with the postseason in mind. Eovaldi pitched for the Yankees in 2015 and 2016, and after missing all of last season due to Tommy John injury, he joined Tampa Bay. He went 3-4 with a 4.26 ERA in 10 starts for the Rays, and was highly-desired at the deadline, with the Red Sox edging the Yankees out to get him. Between Tampa and Boston, he made four starts against the Yankees, going 1-1 with a 1.93 ERA. Porcello, who went 17-7 with a 4.28 ERA this season and pitched out of the bullpen on Friday night, will now start Game 4 on Tuesday night. Red Sox Manager Alex Cora said of what went into this decision, "Obviously, we're all in with this, so never know what can happen in Game 3. Should be Nate 3, Rick 4. Rick pitched that inning on Monday, so we felt like one more day is going to benefit him if we stay away from him. Nate hasn't pitched in a while. He's rested, had a good week, and we're going with him." On when he found out he was starting Monday night, Eovaldi said, "I found out last night once we had landed that I was going to start Game 3. A.C. had already told me ahead of time, like prepare as if I'm going to start Game 3 but expect Game 4. Just the fact that we faced the Yankees so many times, if you're not prepared for them now, you're in trouble. I feel like I'm prepared for them." Eovaldi said of recent success against the Yankees giving him confidence, "Yeah, it definitely gives me confidence just knowing that I've had recent success against them. I'm trying to do the same thing that I have been doing; stay aggressive and try to get that first pitch strike out of the way. On pitching in Yankee Stadium and the key to getting out of here with a good outing, Eovaldi said, "Trying to keep the ball in the ballpark. Try and get quick outs. Try not to let the crowd get too crazy and get behind them and get them going. Again, I feel like the key to that is working ahead and staying ahead and not really giving them the free bases and little things like that." Yankees Manager Aaron Boone said of this change by Boston could "possibly" impact their plan for Game 3, adding, "I'm going to talk to my coaches and just see if there's anything different we might consider doing if we want to get anyone in there. Obviously, a lot will depend on Hicks and seeing if he's good to go and all that. It's something we'll talk about and consider if there's any tweaks we'll make at all to our lineup, but I haven't decided that yet." On where this game ranks in terms of importance in his baseball career, Eovaldi said, "Yeah, obviously, this is my first postseason start. I'm excited. This is what we play for, coming out of Spring Training and preparing for this moment. I'm excited, ready to go. It's definitely probably the most important game I've ever pitched in. We need to win tonight, and that way we can be ready to go for Game 4." Eovaldi was asked if, when he was traded to Boston, he could have envisioned starting such a key game in a 1-1 series in a Game 3, "No. Where I was at the start of the season with the Rays and stuff, I felt we had good things going over there, but with the Red Sox in the division, they were running away with it. Then to get traded over here, I'm super excited to be in this situation. Now that I'm here, I can see it, but at the time before, I wasn't thinking about it." 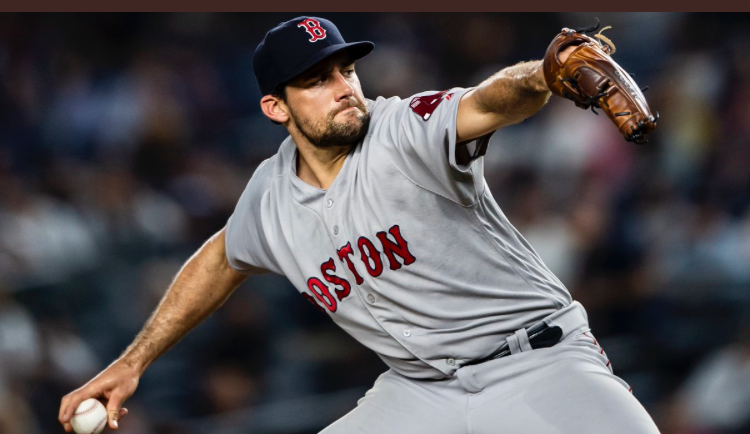 Eovaldi said of overcoming his Yankee career ending suddenly due to the second Tommy John surgery in his career and he said of getting through that on a personal basis to be here, "I feel like with those injuries it's helped me grow a lot as a player, in a lot of different ways as well. But to come back and kind of be in this situation again, I'd hurt my arm against the Red Sox, and now I'm on this side of it and back in Yankee Stadium in this situation. I think it's kind of cool...I feel like the Rays did a great job. They let me rehab with the team. So I was down at Tropicana Field instead of at the Spring Training facility. So I was around a lot of the guys. Just being around your teammates, getting to watch them go through their ups and downs, just being a part of it still, it helps out a lot keeping you focused and knowing that you have other guys to talk to a lot of the times, and you're not just kind of trapped and going through it by yourself. I feel like they encouraged me. They definitely helped me out through that situation and just moving forward."